Heading home to Liverpool for Christmas, Molly Mackenzie isn’t just looking forward to the mulled wine and mince pies – she’s got high hopes for who she’ll find under the mistletoe this year! Unable to forget the delicious near miss with her brother’s best friend, Jake, last New Year’s Eve, Molly’s got a new resolution at the top of her list: seduce Jake and get this crazy chemistry out the way before it has serious repercussions on the rest of the Mackenzie family. Only Molly has underestimated the magic of the holiday season … The more stolen moments in the snow that she shares with Jake, the more determined she is to make it a whole lot more than just a kiss before midnight. I kindly received The Kiss Before Midnight in exchange of an honest review by the publisher via NetGalley. Readers, I am honest with you. I had not a very good start with Sophies writing this year. I read Room For Love, which was published with Carina UK in May. The book wasn't bad, just not much cup of tea. If you fancy a look, you can read my review here. So you might think, why did I bother to read another book by her? It's very simple. I rarly give up on an author. I like to give them a second go and also give them a chance to win me over. 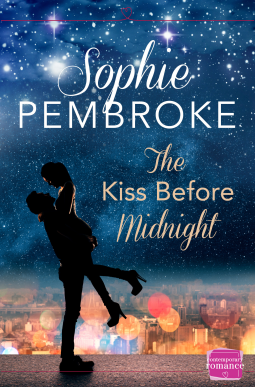 Enough of babbling, let me tell you how Sophie made me very enjoy The Kiss Before Midnight. One year has passed and it's Christmas again. Molly Mackenzie, our main character in this novella, is on her way from London to her family in Liverpool. There is one thing she couldn't forget about last years Christmas. She kissed Jake, her brothers best friend. Molly hasn’t been able to get Jake off her mind. Last Christmas Molly made a resolution list. The last thing which is not fullfiled is: Seduce Jake. She thinks a few good days of snogging will get him out of her system. The only problem is, the more time she spends with Jake… the more time she wants to spend with him. I was immetately drawn to this utterly stunning cover! When the blurb also sounded very lovely too, I just couldn't resist requesting this title on NetGalley. Sophie Pembroke tells the reader in such a charming way the story about Molly and Jake. Told out of both characters point of fews you can get an great insight about their thoughts and feelings. I enjoyed how the story builded up and progressed. There is some great tension between them right from the start. The story is well written, has likeable characters and filled with magic and make for a great holiday read. I'd definitely recommend The Kiss Before Midnight if you are looking for a holiday romance with the exact amount of fun, sparks, sexiness and sweetness. The Kiss Before Midnight should be on your to be read pile this Christmas.